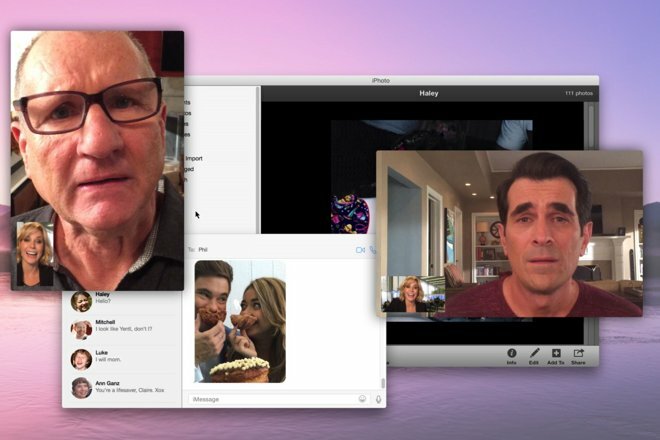 A forthcoming episode of hit television comedy Modern Family puts Apple's iOS and OS X communication services —notably iMessage and FaceTime —front and center, with the production crew shooting footage exclusively on the iPhone 6 and iPad Air 2. A still from the episode, via The Verge. The entire episode plays out on a Mac OS X desktop as family matriarch Claire Dunphy attempts to reach her daughter while stuck in an airport, according to Re/code. Every shot of the Dunphy family calling or texting each other was taken using an iPhone 6 or iPad Air 2 provided to the production by Apple. The OS X Yosemite desktop that hosts the numerous conversations is a facsimile, however. The show's motion graphics crew created a detailed replica of Apple's desktop operating system that took "months" to prepare and was updated with each new release, largely due to the infeasibility of recording and then broadcasting an actual display in high definition. "Basically, what you're seeing on screen is all hand-made," motion graphics producer John Brown told the publication. In a separate interview with The Verge, brown revealed that the initial intention was to use screen capture, but that technique did not hold up to the editing process. "I was building the assets for Yosemite back when Yosemite was still in beta," he said, adding that Apple's constant updates became somewhat of a thorn in his side. "It was frustrating to be like, 'Act one, totally locked,' and then come in Monday and hear the FaceTime notification has changed." In addition to the iPhones and iPads, Apple reportedly provided MacBook Pros and a Mac Pro for postproduction, though the company did not pay for any product placement. Fans of the show can catch the Apple-centric episode next Wednesday, Feb. 25, on ABC.